I know they won't post my comment on the "unveiling of our new logo" because the posts are moderated and all of the comments about it are positive. I had to laugh reading the "unveiling" with all of the new -age, woo woo stuff that "went into the design" (their words) apparently, the new logo is to "empower and embolden" << Wha..?? What exactly does that MEAN, exactly? So, the new logo is to "encourage empathy" and so on- oh it all seems just so silly and weird. I think whomever made the new logo (which looks more old fashioned than the OLD logo, in my opinion) put WAYyYYYY too much thought- and thought I can only imagine came out of a United Nations "plan for re-districting year 2020" sales pitch, or a glossy ad for a Bikram Yoga or Mindfulness center than a crochet forum. By the way, don't be fooled by the words they use, they do not mean the same as WE know them.. all that empowerment stuff. It seems well intentioned, but their definition is not the same as what we think it is. Just look it up. anyway, my two cents- and I have a funny feeling this post will be removed shortly, or not appear at all! Some people cannot handle criticism- so much for "empathy" or "emboldening" right? We'll see. I'm not crazy about the new logo either. I didn't know a new one was being considered. Why change it at all after going through having the old one made "official" in the past? Whatever. Also as you get older you don’t like change but if you want to survive your sanity, you accept and move on. Some will think the new baby is looking just fine and some may not. You said that so well. My brain has to work harder with the new logo which isnt necessarily a bad thing. The thin purple flowing lines are harder to process and they had to explain it to me. I never noticed the crochet hook. The old logo was visually easier for me to process as it was simple and bold. No explanation necessary. I immediately saw the crochet hook. All in all its not going to really matter much. Now I will just have to stop and hunt for the Crochetville logo at Ravelry instead of being able to instantly recognize it. I will always be partial to the old logo because of all the beautiful totes Mary Jo has made and given away. No matter what changes they make it will always be the logo in my heart. cheers Tampa Guy, no hard feelings meant at all! lol- I'll never forget a comment I heard from a recently released elderly convict, who'd just served about 20 years- he was asked by a journalist what he noticed most about "the outside" : "people.. they all look and dress like slobs!" The journalist replied "well... we just have to accept it" His right on response that I will never forget was "No, no I don't have to accept it"
We're instilled with all sorts of reminders that we have to tolerate this, and put up with that, like apathetic little robots. We do not have to tolerate anything. Why am I ranting on about a simple logo? Because it is not just a simple logo. Read the weird buzz phrases that accompany it: it's right out of a left wing playbook, and not just a logo revealed- there were all kinds of nutty strings attached. That is how they getcha- with the strings. I have to be honest, I really don't know what your point is other than you don't like the new logo. Is the new logo only on the blog? I still see the "old" logo on the forums. Same here on seeing the hook. I didn't even register that the ball of yarn has the C around it! LOL I think it's attractive but maybe a little fussy and I like the colors. 2manythreads, I understand exactly what you are saying. I think what Tampa Guy means about accepting things and moving on is that they are not going to change the logo because a few people don't care for it. You are right, you don't have to accept it. You are free to leave crochetville at any time. I don't mean that in a cynical way. Despite how the world is getting, it is a blessing that we do still have the freedom to choose to not participate or be involved with things that are offensive to us or go against our core beliefs. I don't care for the logo either,or the new agey philosophies behind it, but for me it doesn't affect the forum where there are many lovely people that share the same interest as me. Girls, girls! Let's not have a cat fight! I also like the old, but I kind of like the new, also! Things just have to change every now and then--but it isn't going to hurt anything on this forum! Thanks for the baby blanket pattern, Brenda! It's lovely! Hi, everyone! First of all, I'd like to say how sorry I am that I wasn't the first to announce the news of our new logo here on the forum. Donna and I fully understand how attached to the old logo many of you are (as we are! ), and we wanted to find the best way to make the announcement to you, our very special forum family members. I also wanted to be available to respond in a timely manner to any concerns and comments any of you may have. The logo design process took longer than we anticipated. We barely had time to post the announcement on our blog before we left for the Crochet Guild's annual conference. That had to be done because the new logo would be on display in our vendor booth (banner, product packaging, etc.). I'm now back home from the conference, caught up on things at home, and available to be here. If you'd like to read the full story behind the development of the new logo, you can read this post on the Crochetville blog. We know not everyone is going to like the new logo, understand the need for it, or even care about the story behind the creation. That's okay. We wanted to share the story with you anyway. You are more than welcome to share your opinions about the logo with us, whether they be positive or negative. The only requirement is that our Community Policies are followed: Opinions should be expressed in a polite, respectful manner and that there be no political discussion or personal attacks. Oh, one more thing: You're probably wondering when the new logo will be unveiled here on the forum. In the upcoming weeks, we'll be upgrading our forum software. The forum will look a little different after the software upgrade, just due to the changes the software developers always make with each new revision. We figure it's best for everyone if there's just one set of changes to get used to all at the same time. So keep the discussion going if you feel like it! I forgot something very important: Mary Jo, you are more than welcome to continue making bags with the old logo. We don't want to change that tradition! I know it was a "thing" in Silicon Valley about 10 years ago, until the local populace got the jist of it and it lost its popularity. The mindfulness (I call it MindLessness) people tried to introduce it into unsuspecting children at a preschool and kindergarten until the parents found out about it. The mindfulness people pretended whatever they were doing was completely innocent, and that they were just spreading love, equality, and etc etc around. Calling them "mindlessness people" is also considered a personal attack, even though it's not directed toward actual forum members. Once you've removed that from your post, I'll edit this post and remove my request and these words from it as well, so we're both compliant with our forum policies. EDIT: It's been over 48 hours since my request to edit the post, so I've done the editing myself. I didn't want to remove OP's words, so I changed the font to a pale gray and struck-through the text, leaving an "edited by" note explaining the reason for the edit. I also want to reassure you that the comment you left on our blog was not deleted, despite its adversarial tone. We have to moderate blog comments so that we don't get all sorts of nasty comments left by spammers. Once a new commenter has their first comment approved, subsequent comments will not enter the moderation queue. Today was the first time I'd had to approve new blog comments since we made the post. The comments you were able to see had been left by people who had left previous comments on the blog. I'm not sure what Donna and I have done to cause you to have such a negative opinion of us. I can assure you that we don't delete comments or posts simply because people disagree with us. However, we do reserve the right to delete posts that contain personal attacks, profanity, are just overwhelmingly nasty in tone, or that violate our site policies. Luckily, we very rarely have to do that. I can't remember the last time I had to delete something that wasn't very obviously spam. I'd like to elaborate on empowerment. Empowerment simply means to give power or to enable. 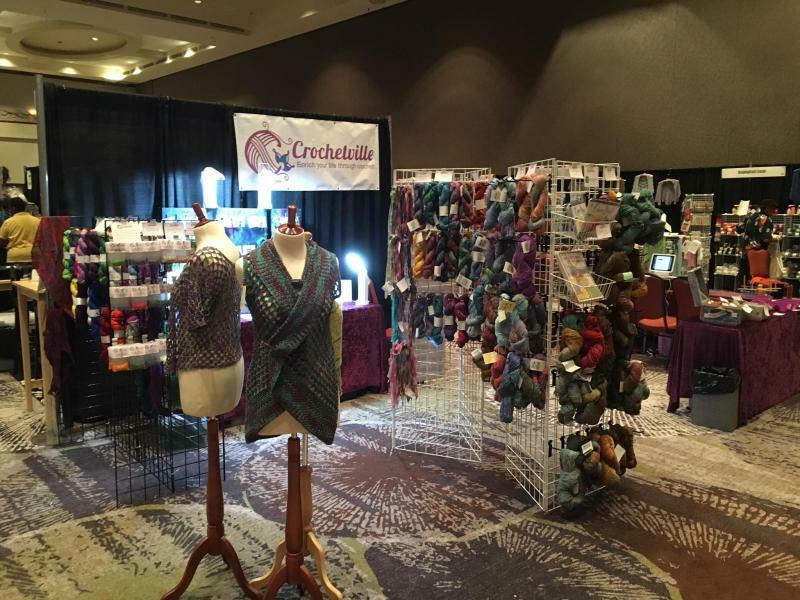 Crochetville has always been a place where people can feel empowered in crochet. We didn't come up with that; it simply is. 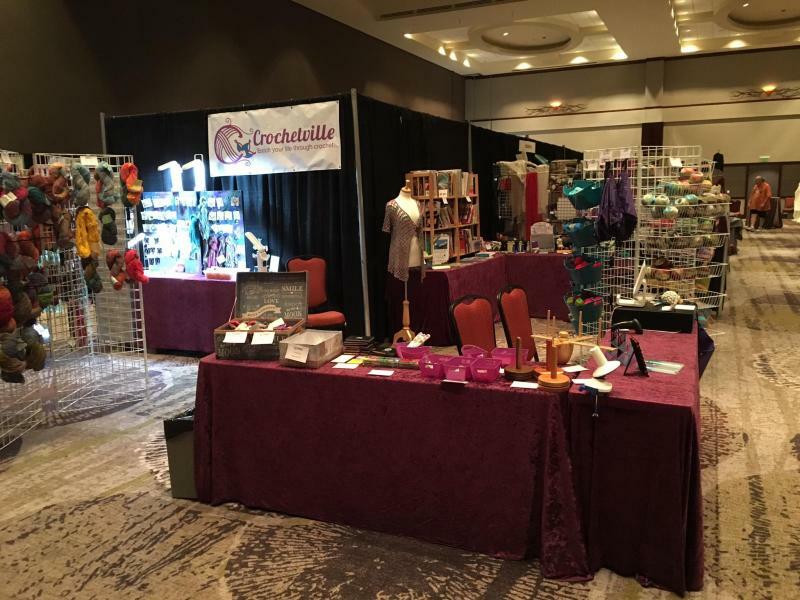 I think that's because of the grassroots way Crochetville started 12 years ago; we've always supported each other. Empowerment may come though receiving encouragement, through the support of a community of people who appreciate crochet, through exploring new possibilities (whether it is learning a new stitch or having a stand at a Farmer's Market), through being appreciated, or through many other ways. When a person feels power in one area, it can spread other parts of her life. Crochet may be a hobby and a skill, but it can be much more. To view from a different perspective, put another word in the place of crochet. Running. Organizing events. Public speaking. Decorating cakes. Telling jokes. Making jewelry. Working out. Inventing gadgets. All of these things can be considered hobbies, but they also have the potential to make powerful changes your life, and have done so for many people. There is a very inspiring story of a now well-known crochet author who escaped an abusive situation and an externally dangerous environment. 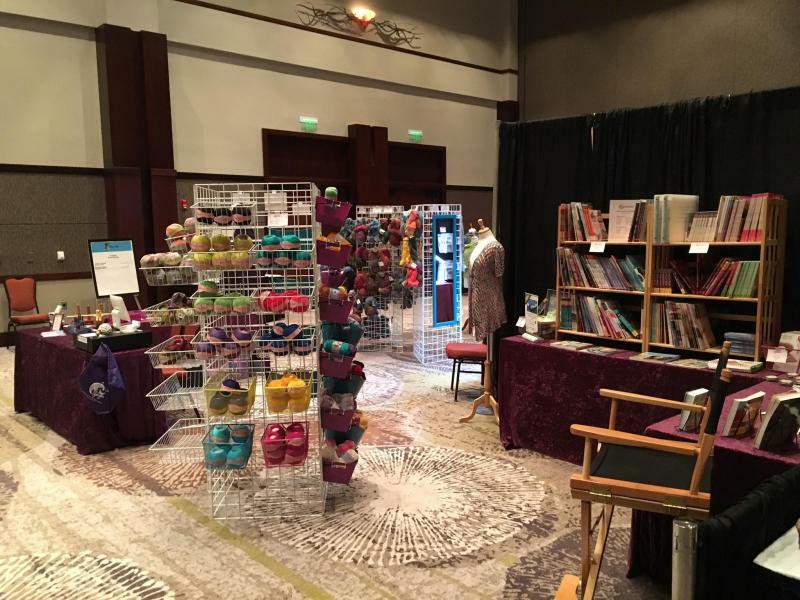 She had never crocheted before but crochet became an important part of her plan and her journey as well as an inspiration to her in trying to change her life. And she had great success. Also, The Crochet Dude got his start here on Crochetville, and has credited forum members with encouraging him in his craft and his crochet career. I'm not saying everyone needs to make crochet a career. There are many other ways crochet can positively affect your life. Hobbies (like crochet) are important to our health and our well-being. Sometimes they even give us a reason to get up in the morning. Although we did not use use the word mindfulness in our blog post about the new logo, since it has been mentioned, I will say I do think that being mindful is a good thing. Like being mindful of one's responsibilities: am I doing the things I need to do each day at home and at work? Being mindful of those around us: am I aware of how my actions affect others; am I aware of people who might need my help? (For example, if I'm in a bad mood, do I make things difficult for others? Do I notice and help a lady at the grocery store who can't reach something on the top shelf?) Being mindful is simply being aware and attentive. I hope this helps give a better understanding of our thoughts. Thank you Donna and Amy for giving clarification to your intended usage and meaning of your choice of words. I have avoided this thread, as I did not want to get into a tug and pull. Let me say one thing. I am old, I do not like change. It takes me quite a while to change anything in the house, be it a piece of furniture or even a set of curtains. While the new logo is pretty, I don't think it really represents THIS site. We Love the simple and straight forward, well, I should say I love the simple and straight forward. That is just my opinion. Thank you Amy for saying I could still use the old Logo when you change, as I have tried to make a graph for the new one and it just doesn't work. This is what I like, being able to voice an opinion calmly and nicely. We really do appreciate how attached everyone is to our original logo. We're attached to it ourselves. Change is difficult for Donna and me as well. We've known for years that we needed a new logo, but we kept putting off making the change. Hopefully, the new logo and color scheme will grow on people as everyone gets used to the change. 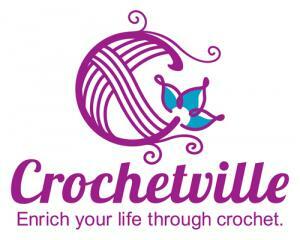 The old logo will always be a much-loved part of Crochetville's history. It's just time for us to have a logo that we believe reflects the entirety of what Crochetville has become and that will meet our needs as we continue to grow in the crochet industry. The new logo is designed in a manner that allows to use it in many ways. For example, we had it turned into a pin and had it printed on a drawstring backpack. 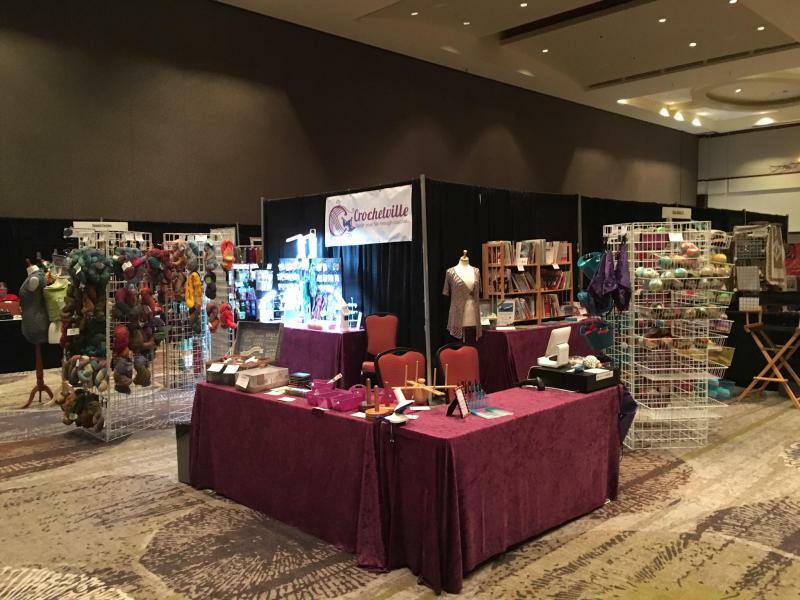 Both were available for sale in our booth at the Crochet Guild's conference or choice of either as a free gift with a $75 purchase. We also donated 150 backpacks to be used as the goodie bags (stuffed with donations from other sponsors) for the member meeting. Here's a picture of the backpack. I'll try to dig the pins out of my show stuff later so I can show you a picture. We could never have done this with the old logo. Please keep sharing your thoughts with us. 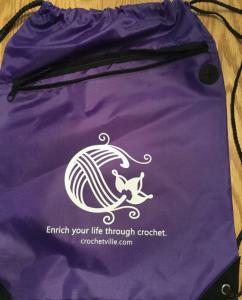 That's what Crochetville is all about! 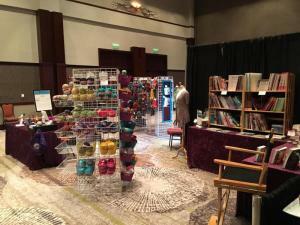 I thought you might enjoy seeing what our booth looked like at the conference. 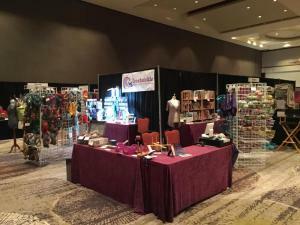 We had 3 booth spaces, in a reverse-L configuration. We're going to invest in a second banner for next time for the other 8' drape in the back. These pictures were taken after the 2-hour market preview on opening night. We had almost sold out of some things. We had to restock and rearrange the next morning.